A unique collection of gouache miniature paintings on mica. It is part of our everyday-life; you can find it in shiny cosmetics and make-up, watercolours, cement and asphalt, insulation material in electric cables, Christmas decoration, and medical and defence technology need it too: the glittery, naturally occurring mineral mica. Every now and again it is also mentioned in the media in connection to illegal mines in India and child labour. Beautiful gouache miniature paintings, however, are not the first thing to come to mind when talking about mica. During the second half of the 19th century Indian native painting started to leave the realm of sacral art to develop new, hybrid styles influenced by Western artists who travelled India in great numbers with their oil colours and easels. One can safely state that this was the period that modern Indian art took off. 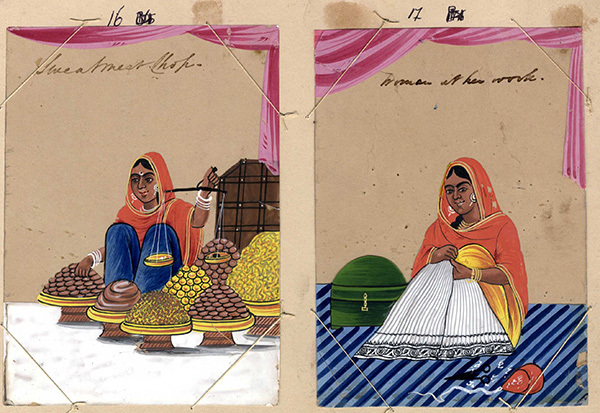 One such new style developed in Patna around 1850: miniature paintings in watercolours on paper or mica. 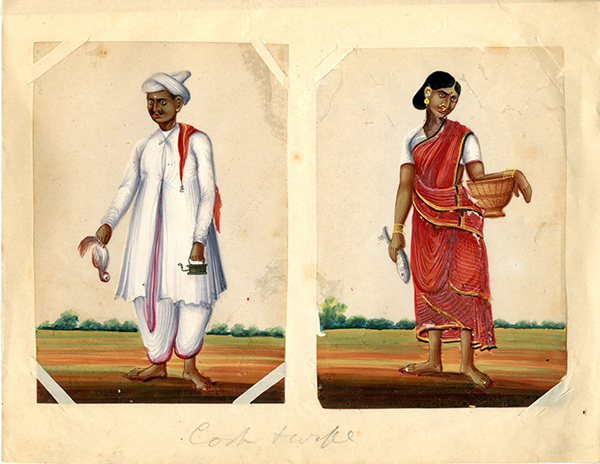 A second centre of mica paintings emerged in Trichinopoly in the 1860s. 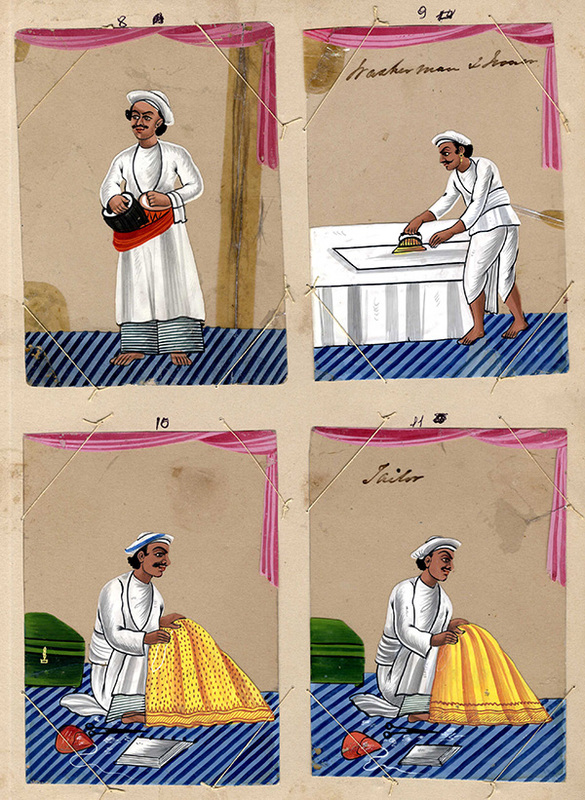 Whole insertion albums of miniatures were commissioned, often by the British Trade Company (that´s why this particular style is also referred to as Company and Patna style). However, in their early phase these miniatures were far from being considered art, neither by the maker nor the buyer. Rather, they functioned more like a means of documentation in a time when photography was still in its embryonic state. Paintings of occupations and of house servants were very popular. 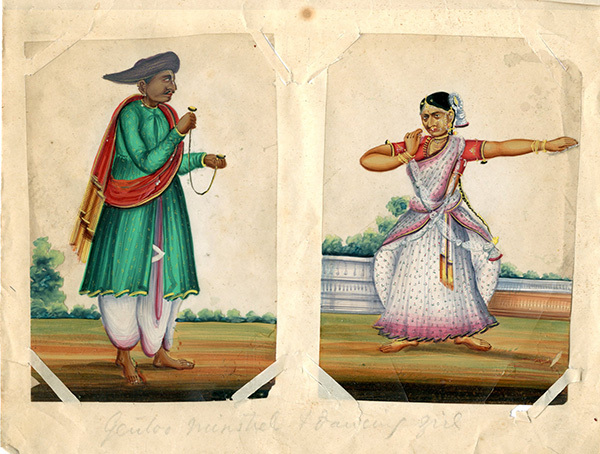 High numbers of mica miniatures were produced to be sold along the road as souvenirs showing scenes of everyday life, but also rituals, local festivities, and regalia of princely courts. One may almost speak of mass production. Mica can easily resist more than 500 degrees Celsius, but the miniatures still are fragile and the paint comes off quite easily. Hence, despite the fact that thousands and thousands of them circulated in 19th century India, they are now getting quite scarce. It should not come as a surprise that the largest collections of mica miniatures are found in the museums and libraries of the former colonial empire of Great Britain. Since 2016, Leiden University Libraries has acquired 68 mica miniatures, almost all of them likely to date back to the 1850s and 1860s. One set of micas stands out (Or. 27.096). Instead of featuring one character to represent an occupation, these micas are paired up and show a couple that is performing their trade together. English captions in Victorian handwriting by the anonymous collector inform the observer what occupation is depicted. Mica miniatures are no longer sold along the road as souvenirs but traded as desirable collectables at online-auction, achieving impressive prices. Once in a while you come across a modern mica miniature - an attempt to revive this art? Or an attempt to mislead the potential buyer? The Gandhi portrait below, for example, is not likely to date back to the 1930s, as claimed by the seller. 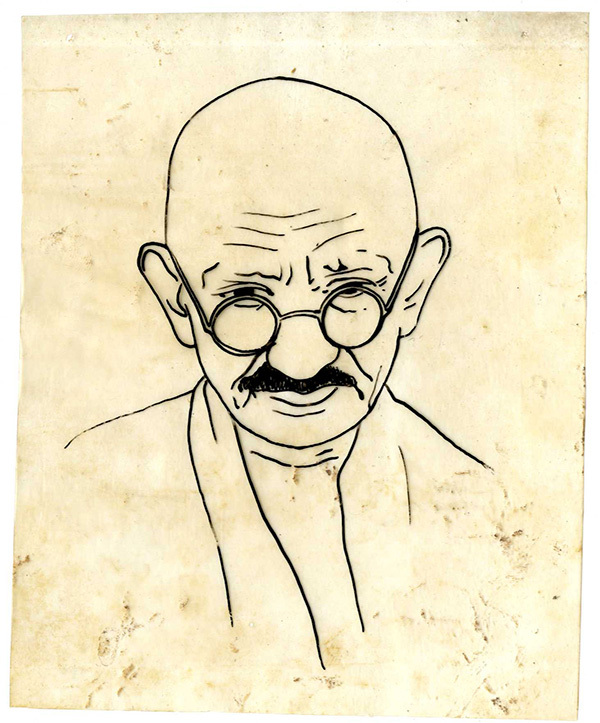 In fact, it strikingly resembles Gandhi portraits that YouTube offers to teach you how to draw in five minutes.